Map showing the Siegfried Line pillboxes and tank barriers (dragons teeth). The spots marked with a red arrow is where the Combat Commands of the 3rd Armored breached the line. On 12 September, the 3rd Armored Division had come close to the first barrier of the SIEGFRIED LINE. The Division Commander ordered both Combat Commands to initiate vigorous patrols beginning at 0800 on 12 September to probe the line and find a weak spot, if possible. Both Combat Commands sent patrols as instructed. Combat Command "A" patrols reached the first tank barriers of the SIEGFRIED LINE at about 1630. Combat Command "B"'s first patrol (reinforced company) was stopped by bad terrain. Another similar patrol was sent out immediately from Task Force Lovelady, and at 1451 on 12 September, this patrol crossed the German border and a few minutes later was in the town of ROETGEN, Germany. The remainder of Task Force Lovelady, following the advance patrol, found the resistance within the town was negligible. The town was outposted while the bulk of the Task Force moved on through and bivouacked just north of the outskirts of the town. ROETGEN was the first German town to fall to the Allies in World War II. Combat Command "B" was but a short distance from the tank barriers. Now both Combat Commands were face to face with the SIEGFRIED LINE and plans were made to breach the first defenses on the following day. The action which followed is really two separate stories, and will be so treated here. Brigadier General Hickey, commanding Combat Command "A", elected to make a penetration of the first line of defenses with Task Force "X", composed of a battalion of tanks from the 32nd Armored Regiment, a battalion of infantry from the 36th Armored Infantry Regiment, a tank destroyer platoon from the 703rd Tank Destroyer Battalion and a company of engineers from the 23rd Armored Engineer Battalion. This force was commanded by Colonel (then Lt. Colonel) Leander L. Doan. The point selected for the penetration was about one kilometer south of OBERFORSTBACH and just to the east or the EUPEN-EYNATTEN road. In the OBERFORSTBACH vicinity, the outer defenses of the SIEGFRIED LINE ran in a northwest to southeast direction, one thousand yards or less behind the border. The defenses were faced all along the line with "dragon's teeth," and large pillboxes every one hundred yards or so to the rear on favorable terrain, and further supported by some hasty trenching and numerous large caliber guns and mortars in depth. These defenses were placed in fairly open, moderately rolling terrain. The high ground at OBERFORSTBACH commanded observation of the area. Across the possible north-south lines of fire, however, ran a gentle east-west ridge. Both ridge and draw were on the German side of the barrier and immediately covered by pillboxes. However, these terrain features provided some concealment from observation to the north, and offered a route for flanking movement to the east. During the night of 12-13 September, Task Force "X" assembled in the concealment of the AACHEN-EYNATTEN woods with the Command Post near LANGFELD. Night patrols were sent out, and contact was made with the enemy at the line of obstacles. The plan for breaching the line was simple. The infantry, supported by direct tank and tank destroyer fire, would move through the dragon's teeth and secure the first high ground beyond. Next, the engineers of the 23rd would breach the obstacle line with demolitions and the tanks would follow through. The exact point selected for penetration was covered by one pillbox to the immediate front about one hundred and fifty yards beyond the dragon's teeth. While waiting for the tanks to move into supporting position, the infantry commander fired about fifty rounds of tank destroyer fire into the pillbox. It was penetrated in several places and did not return the fire. The infantry moved through the barrier and as they came to the crest of the first ridge, about two hundred yards beyond, they were raked by machine gun fire from another pillbox to the right front and forced to withdraw to the dragons teeth for cover. An attempt was made to approach this second pillbox from the west in a flanking maneuver, but fire started coming from the first pillbox believed to have been knocked out. (There were 12 Germans in this pillbox and when called on to surrender they answered, "Go to hell, we will fight it out.") This attack and a third failed, and heavy mortar fire began to cover the area. For the next two hours the situation did not improve. During this period, the engineers were working at placing demolition charges in spite of the heavy mortar fire. At about 1500, Colonel Doan conferred with the Division Commander and Combat Command "A" Commander. It was decided to use a previously discovered crossing over the barrier about three hundred yards to the right of the intended point of penetration. This crossing was a roadway made by filling in between the teeth with stone and earth and was apparently constructed by local civilians for their own convenience. The passage was under heavy mortar fire and was reported to be mined, so a flail tank was sent over first. It stuck in the loose earth and threatened to tip over and block the passage. Two tanks were used to tow the flail tank off the roadway, and immediately the twenty tanks of Task Force "X" started to cross the barrier. All were across by 1550 and had started to cruise the pillbox area and the draw south of NERSCHEID. Six pillboxes and several 88's were destroyed. Some of the guns were unmanned. 3AD HQ Convoy Crosses the Siegfried Line on Sept. 15, 1944. Most presumably this photo was taken on a dirt track leading from Langfeld towards Nütheim. Click here to find out why I came to this conclusion. The area has changed quite a bit since 1944. Meanwhile, the infantry battalion had suffered sixty casualties. Captain Plummer, Battalion Commander, was seriously wounded, and the opposition continued to be stubborn. Lt. Colonel William R. Orr was then placed in command of the Infantry Battalion and ordered to turn east toward NÜTHEIM. The tanks were to also move on NÜTHEIM. As the tanks cleaned out the nearest pillboxes and moved over the crest to the north, German artillery and anti-tank fire became extremely heavy, especially from the vicinity of OBERFORSTBACH. To control his tanks, the Task Force Commander had to dismount and confer with individual tank commanders on several occasions, because command tanks had been knocked out. The attack continued toward NÜTHEIM and soon drew anti-tank fire from the vicinity of that town. A halt was made to reorganize between 1700 and 1800. Ten tanks remained in action. Col. Doan radioed General Hickey that he would have to have more stuff to get through. He was told that the 1st Battalion, 26th Infantry Regiment (1st Division), which was attached to Combat Command "A", was on his left rear and had been ordered to attack at 1830 to approach NÜTHEIM from the west. Also that two tank platoons of Task Force "Y" were being sent to reenforce Task Force "X"
The first platoon of reinforcing tanks arrived at about 1900, just at dusk, and the second about an hour later. The Armored Infantry Battalion joined the tanks, and with Combat Command Artillery firing support on the road leading into the village, the attack proceeded with the tanks leading. Small arms fire from the vicinity of NÜTHEIM continued to be heavy, and enemy anti-tank guns knocked out two more of the tanks. At about 2300, Task Force "X" had reached a position just west of NÜTHEIM and closed into a close leaguer for the night. The Armored Infantry Battalion was disposed with one company along the road to the east and other elements at the north and southwest ends of the leaguer area. The Battalion of the 26th, previously referred to, was in position to the west of Task Force "X" and' contact was established with them. The Task Force Commander talked with the Infantry Battalion Commander, and it was determined that the Infantry Battalion would clean put NÜTHEIM on the following day, allowing the armored force to continue as ordered to EILENDORF. The depleted 2nd Battalion of the 32nd Armored Regiment was relieved by the 3rd Battalion, 32nd, and on the morning of 14 September, Task Force "X" was ordered to attack north to the vicinity of EILENDORF. The 1st Battalion, 26th Infantry was released to Division control in place. The Task Force left NÜTHEIM about noon, and, except for a skirmish at BRAND, there was no considerable fighting during the day. The southern outskirts of EILENDORF were reached at about 1930. Some anti-tank fire was encountered. On the morning of the 15th, Task Force "Y" of Combat Command "A" started moving at 0850 to come abreast of and to the south of Task Force "X". This advance was directed at MÜNSTERBUSCH. During the day, elements of the 16th Infantry Regiment were contacted on the left. Not long afterwards, elements of Task Force "X" were against the second row of dragons teeth about 2 kilometers east of EILENDORF in the vicinity of a place called England. This barrier extended northwest and southeast across the low ground on the southern approaches to STOLBERG. Here a platoon of the 1st Battalion, 16th Infantry Regiment was pinned down by heavy fire from pillboxes on the other side. The platoon of infantry withdrew slightly under the cover of tank fire. The tanks soon found a passage through the obstacles blocked only by a few old farm wagons, and the tanks that had supported the infantry pushed these aside and went through. Observing this action, the Combat Command Commander ordered the entire Task Force to move to the east through the gap. At about 1500, as the first tanks advanced to a road junction at AM GEISBERG they received anti-tank fire from the direction of WURSELENER WOODS. Additional tank and anti-tank fire came from the northeast along the road to STOLBERG. Six tanks were lost in quick succession. The Armored Infantry Battalion of Task Force "X" now started to come through and deepen the bridgehead. General Hickey told the Division Commander; "I am pushing infantry out to locate and clear out A. T. Guns. Perimeter is considered large for one battalion. Operation will be slow and probably no more than some support for infantry in the bridgehead can be crossed tonight." Quick advantage of an opening had been seized. A breach in the main defenses of the SIEGFRIED LINE existed, but the towns of MUNSTERBUSCH, STOLBERG, and the WURSELENER WOODS area still needed attention. The Corps Commander ordered the 1st Infantry Division on the left of the 3rd Armored to cooperate in this mop-up process, and the 3rd Armored to assist them in getting on their objective to the northwest. This cooperation was effected with complete success. Combat Command "B", commanded by Brigadier General (then Colonel) Boudinot, operated in the right half of the 3rd Armored Division zone. A study of their operations for the period covered above will complete the picture of the breaching of the SIEGFRIED LINE in the zone of the 3rd Armored. 2nd Bn., 33rd Armd. Regt. 1 Btry., 391st Armd. FA. Bn. 1st Plat. Co. B, 703rd TD Bn. 1st Plat. Co. B, 23rd Armd. Engr. Bn. 1st Bn., 33rd Armd. Regt. F Co., 36th Armd. Inf. Regt. 2nd Plat, B Co., 23rd Engr. Bn. 2nd Plat., B Co., 703rd TD Bn. Positions of Combat Command "B" units on the night of 12 September are shown on sketch "12 Sept. It was planned to move the two task forces north in parallel columns with Task Force 1 on the right. The initial route followed by Task Force 1 was a good road from ROETGEN TO ROTT. About halfway between these two towns this road turns sharply to the west and runs east-west for about two kilometers. Part of this section is along steep cliffs, and here the enemy had blocked the road with a deep crater defended by small arms fire. The work of filling this crater started on the morning of 13 September. Task Force 2's route was a good, straight road leading from ROETGEN to KORNELIMÜNSTER. The first block on this road consisted of cables stretched across the roadway, a steel gate, and mines on the roadway and on the shoulders. This block was defended by small arms fire from pillboxes, and dug in positions to the north. The Task Force attacked this position with infantry and the enemy speedily withdrew. The Armored Infantry Company then moved onto the high ground about five hundred yards to the north, and the engineers removed the mines and destroyed the cables and gate with prepared charges. This job was finished by 1100 hours, and the main body of the Task Force started to move north from KETTENIS. The dragon's teeth with tank ditches defended by pillboxes were visible ahead (east and southeast of SCHMIDTHOF), and Colonel King decided that his depleted infantry company was insufficient for the job. Accordingly, he asked for reiniorcements and went forward to study the situation more closely. 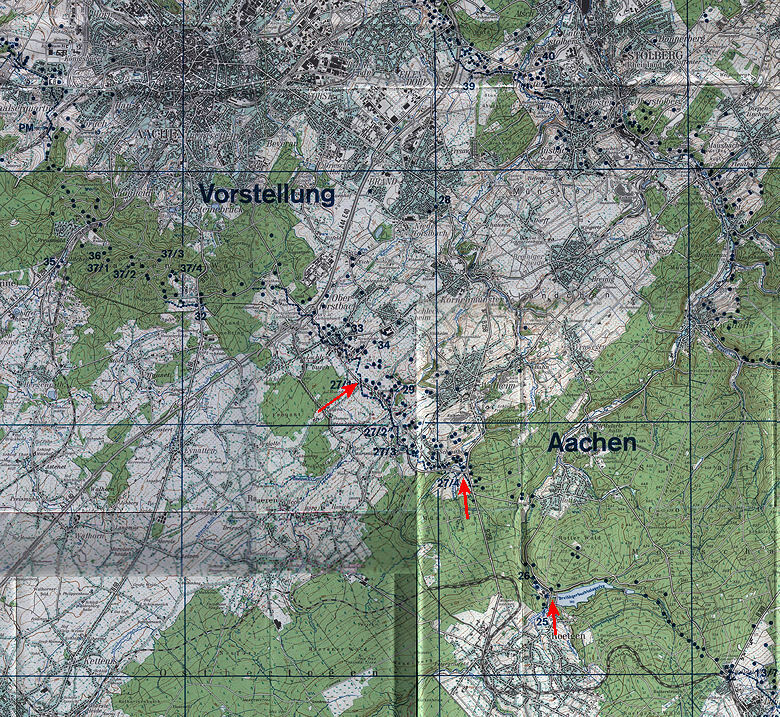 On the right, Task Force 1 had filled the first crater, and had moved north to within one and one-half kilometers of ROTT where further demolition again halted the column. Patrols discovered that the bridge across VICHT CREEK, one and one half kilometers south of VENWEGEN on LAMMERSDORF-KORNELIMÜNSTER road had been destroyed by the enemy. The Task Force Commander planned to put in this bridge during the night, and move on the following morning, 14 September. The Task Force was coiled as shown on the operations sketch and the engineers got underway with the night bridging operation. At 1800 Task Force 2 received as reinforcements H and I Companies of the 36th Armored Infantry Regiment from Division Reserve. In the meantime Colonel King had decided to attack SCHMIDTHOF with his depleted F Company of the 36th, supported by tanks and artillery. These sixty men jumped off after a ten minute artillery preparation at 1730. They were stopped short after initial advances and ordered to hold what they had taken. Two tanks were knocked out by enemy anti-tank fire. Five hundred yards to the south, the engineers were preparing passage over the obstacles. During the night extremely heavy mortar and artillery fire forced F Company to retire to its jump-off position but the breaching operation went on to completion at 2245. While the bridging operation already referred to was in progress, Task Force 1 proceeded to mop up and secure the town of ROTT. During the day the 83rd Armored Reconnaissance Battalion occupied ROETGEN. This Battalion secured the town of ROETGEN until relieved by elements of the 9th Division on 14 September. 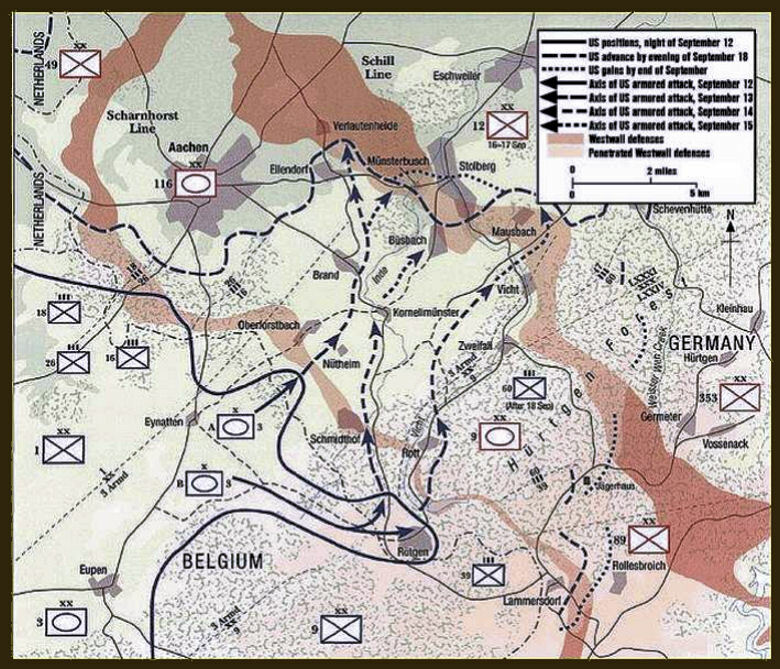 On the left flank, a dangerous gap had developed between elements of Combat Command A and elements of the 1st Division. To cover this gap and protect the Division left flank, the Division Commander sent a Task Force from Division Reserve composed of the 1st Battalion, 33rd Armored Regiment and the 1st Battalion, 26th Infantry Regiment (1st Division). This force was commanded by Lt. Colonel Hogan, the tank battalion commander. Having sent the force to assist Task Force 2, Task Force 1 coiled just south of BREINIGERHEIDE. Both task forces were able to renew the advance at 1515 and reached the positions shown on the operations sketch for the day. Lt. Colonel King had been evacuated because of wounds, and Major Mills assumed command of Task Force 2 southeast of KORNELIMÜNSTER. By 1000 on the 15th of September, Task Force 2 had fought its way to a nose just east of BÜSBACH. Several pillboxes and fortifications were fired on in passing. Task Force 1 was again held up by a blown bridge. This bridge was over GIESCH CREEK on the road from BREINIG to MAUSBACH. Another bridging operation was undertaken, and by 1100 the force started to cross to the northeast. Soon it was stopped by fire from enemy tanks and anti-tank weapons from the area at the southeast edge of MAUSBACH. This was the second line of the SIEGFRIED defenses and seemed to be rather strongly manned, with some supporting tanks, mortars, and artillery in position to the rear. Task Force 1 launched a coordinated attack with tanks and infantry and by 1400 had entered MAUSBACH, breaching the second line of SIEGFRIED defenses. Task Force 2, meanwhile, was held up by another blown bridge in the south end of STOLBERG. It was determined that considerable time would be required to prepare a crossing here, and the Combat Command Commander decided to withdraw Mills' Task Force and have him follow through the breach made by Lovelady's force. On the following day the Division Reserve started mopping up remaining pillboxes and pockets of resistance in the BÜSBACH area. The breaching was widened and deepened during succeeding days and several counterattacks ranging in strength from reinforced company to battalion size were defeated. Mopping up in the STOLBERG-MAUSBACH area continued until 23 September. At that time, the Division front was narrowed when the 1st Division took over the part of Combat Command "A"'s sector west of the VICHT river. The eighteen day trek from the SEINE to the SIEGFRIED LINE had sapped the strength of the 3rd Armored. The mopping up and consolidation around STOLBERG was extensive too. The men were tired and the machines needed maintenance in the worst way. On 18 September there were 153 medium and 148 light tanks operative in the whole division. Of the mediums, about 30 would run only in low gear. A total of about one hundred tanks were in satisfactory operating condition. Sixty-six officers and 887 enlisted men had been received as reinforcements between 15 and 23 September, but the strength report showed that the Division was up to only 90.4% of full strength in officers and 90.9% of full strength in enlisted personnel. I'm very grateful to Vice Daemon for his help and support.